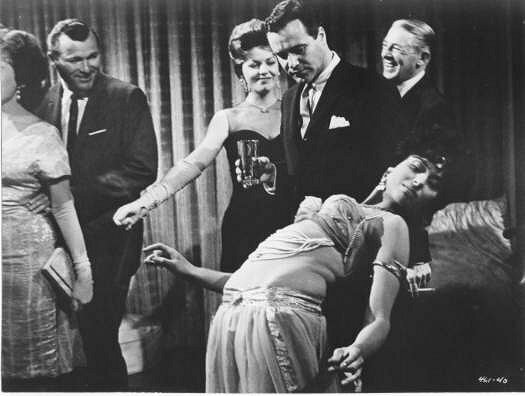 Lisa Guiraut (Leila) is best known as the dancer who catches the eye of Sean Connery's Bond in From Russia With Love (1963). She also had dance cameos in the TV show Espionage (in the episode The Weakling) (1963), starring Dennis Hopper and Patricia Neal, and in the classic 1962 film The Days of Wine and Roses. UPDATE [23/02/12]: After months of searching, I have found a pic of Lisa in the "dancing on the yacht" scene from The Days of Wine and Roses! If anyone has a clip please let me know. She was in a German TV mini-series in the late 1960s, had a walk-on part in a 1982 French farce about a bank clerk "given" a prostitute as a retirement gift. And then ... nothing. Not even a Wikipedia page. Good luck with that if you're brave enough to try it. "On his way up the Nile, he was received in state at Khartoum by the Egyptian Governor-General of the Sudan, his immediate official superior. The function ended in a prolonged banquet, followed by a mixed ballet of soldiers and completely naked young women, who danced in a circle, beat time with their feet, and accompanied their gestures with a curious sound of clucking. At last the Austrian Consul, overcome by the exhilaration of the scene, flung himself in a frenzy among the dancers; the Governor General, shouting with delight, seemed about to follow suit, when Gordon abruptly left the room, and the party broke up in confusion." Hola! Mi madre era amiga de Leila cuando ella actuaba en Mohammedia (marruecos) en los años 60, estoy muy interesada en poder contactar con ella para que mi madre y ella puedan reencontrarse. Yo tambien soy bellydancer y acabo de hacerle un homenaje a Leila, en mi video Naima - Raks Mustafa en Youtube. Hello! My mother was friends with Leila when she acted in Mohammedia (Morocco) in the 60's, I am very interested to contact her for my mother and she can be reunited. I too am a bellydancer and I just make a tribute to Leila, in my video Naima - Raks Mustapha on Youtube. Leila, get in touch with Naima. I just watched her video on YouTube and Naima is a wonderful dancer who has done you proud. I met Leila at her Bar Dallas in 1987. She was very kind to me. The place was adorned with posters of her career of shows from around the world, and she walked me around and shared her memories of each one. One night, the power went out, and a friend and I worked to get it restored. We lit candles and a waitress (Fiona) and I ended up sitting on the bar singing, and keeping people entertained. Such a wonderful memory. Wow, I was there in 87, off the Kennedy. Lisa was very nice. There was a waitress named Elaine Brown, who sold local goods at every port we visited.